George Frederick Keller used the invasion theme once again with the Burlingame Treaty as the subject. 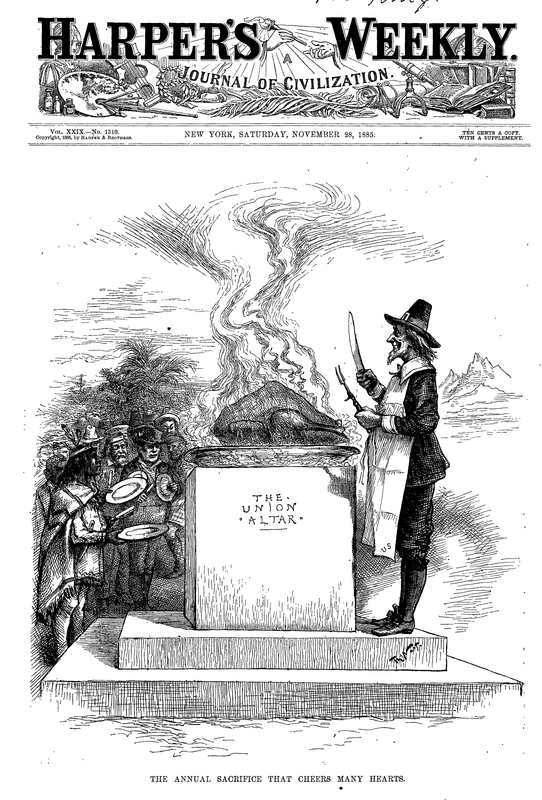 West called Keller’s Devastation, October 2, 1880 “the best drawn of the many cartoons that Keller created decrying Chinese immigration…The tattered ineffectual scarecrow is Denis Kearney, the leader of the Workingmen’s Party”(148). Instead of insects used in Uncle Sam’s Farm is in Danger, here the Chinese immigrants are dehumanized and represented as pigs bursting through an Asian gateway, named “Burlingame Treaty.” The brown, hairy, porcines with Chinese faces make a bee-line toward Uncle Sam’s cornfield, and devour everything in sight. In addition to their tails, a queue grows from the back of each of the pig’s head. 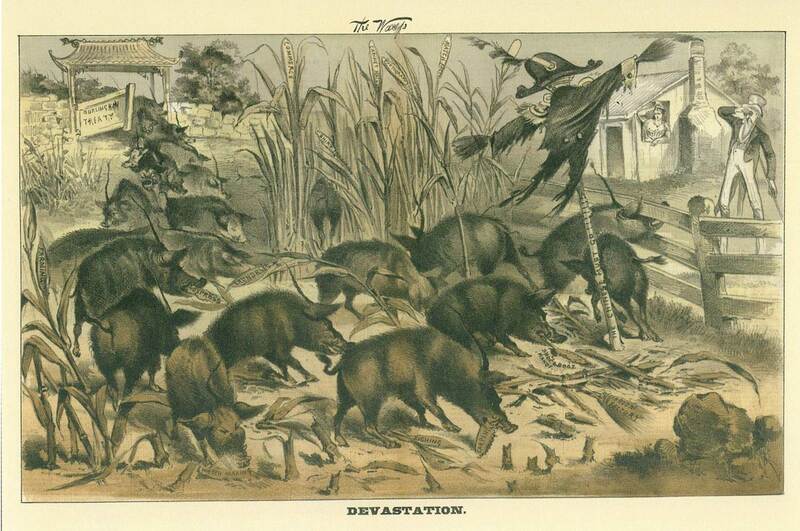 Cornstalks, represent the job-rich industries of “watch making,” “laundries,” “shirt factories,”” broom factories,” and “cabinet makers,” to name a few, that fall victim to the crunching, ravenous appetite of the pestilent pigs. Kearney’s scarecrow is left in tatters. He swings around a pole emblazoned with “The Chinese Must Go!!!!!! !” Uncle Sam, exasperated, watches from his lawn on the other side of his fence. Columbia peers out a window of their modest American home. Both she and Uncle Sam are minimized, weak and ineffectual. The Chinese have caused utter devastation. Employing agricultural symbolism to suggest that the Chinese would destroy California agriculture is deeply ironic. California agriculture owed a great deal to Asian Americans. Ronald Takaki explains that the Chinese were at the very center of California’s success as an agricultural producer. “Their work boosted the value of the land from twenty-eight dollars an acre in 1875 to one hundred dollars an acre two years later” (89). As livestock animals, pigs or hogs were considered the lowest form of animal because of their greedy, rooting nature (McNeur 641). 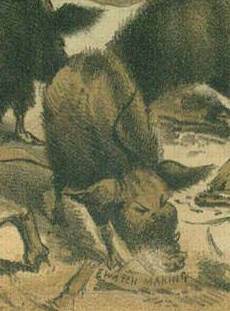 In the early nineteenth century, particularly in New York City, hogs were believed to be the carriers of disease and pestilence. “Swine were closely tied to the filth and unpleasant smells that characterized the streets and public places of the city. Hogs and garbage, after all, went hand in hand” (McNeur 643). It is not unreasonable that these attitudes traveled westward. Comparing the Chinese to swine helped to define them as “others” and cement a perception that the Chinese were unsanitary and disease ridden – a pervasive stereotype attributed to the Chinese. 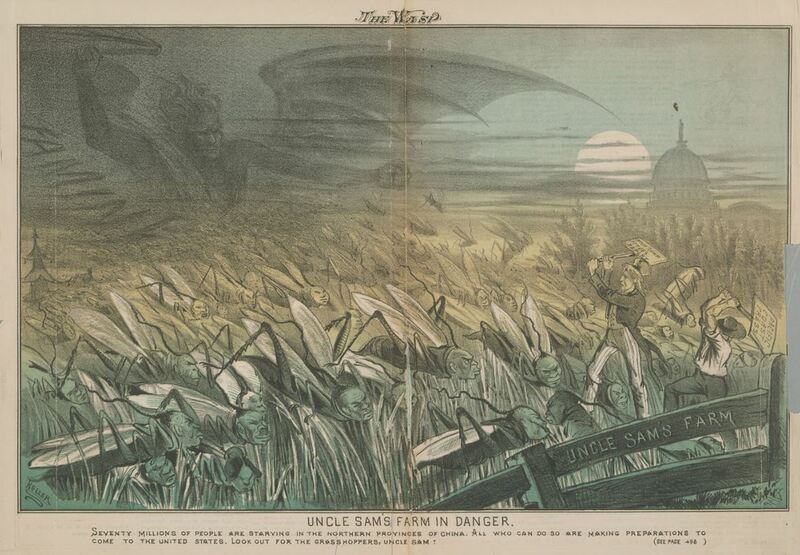 George F.Keller’s 1878 piece, Uncle Sam’s Farm in Danger adopted and mastered classic invasion imagery and animal symbolism to devastating effect. “Our artist has represented the possible immigration as a swarm of grasshoppers driven along by the inexorable hand of Famine…Uncle Sam, armed with the House Committee Resolutions, assisted by his hired man, the California Press, is striving to stay the torrent of yellow grasshoppers. It seems almost impossible for them to succeed; and it is certain that they will be overcome by the invader unless assistance of a more substantial kind be rendered” (Wasp 498). The image is disturbing. Precisely what The Wasp had hoped to achieve. With this image, Keller perfected the technique of invasion/infestation imagery. As the caption and supporting article made clear, The Wasp stoked the fear that widespread famine in China would drive millions of additional Chinese to emigrate to America. Something was needed to stop this danger! The Wasp knew exactly what fear-mongering buttons to push. An uphill battle faces Uncle Sam as he fights off this swarm. Meanwhile, the dark, ghoulish specter of Chinese famine ushers in and emboldens new invaders to feast on an American bounty while the getting is good. Evoking this particular insect symbolism was a clever choice to grab attention and arouse the emotions of Californians whose livelihood depended on the continued success of the agricultural sector. The grasshopper was acutely feared in California’s agricultural community. In 1828 a grasshopper plague caused near famine, and in the great plague of 1874-1878, the crop-munching insect was responsible for the wide-spread destruction in the Midwest, causing western governors to organize days of prayer to keep the tide from coming westward (Schlebecker). “California was the locus of Chinese advances in agriculture” (Takaki 89). The Chinese were the anthesis of greedy locusts.The irony of course, is that California’s agriculture success was cultivated and directly benefited from the transformative innovations contributed by the Chinese. “Their work boosted the value of the land from twenty-eight dollars an acre in 1875 to one hundred dollars an acre two years later” (Takaki 89). Keller also used agricultural imagery in his cartoon Devastation. Like Nast,The Burlingame Treaty factored as an ingredient in Keller’s work. 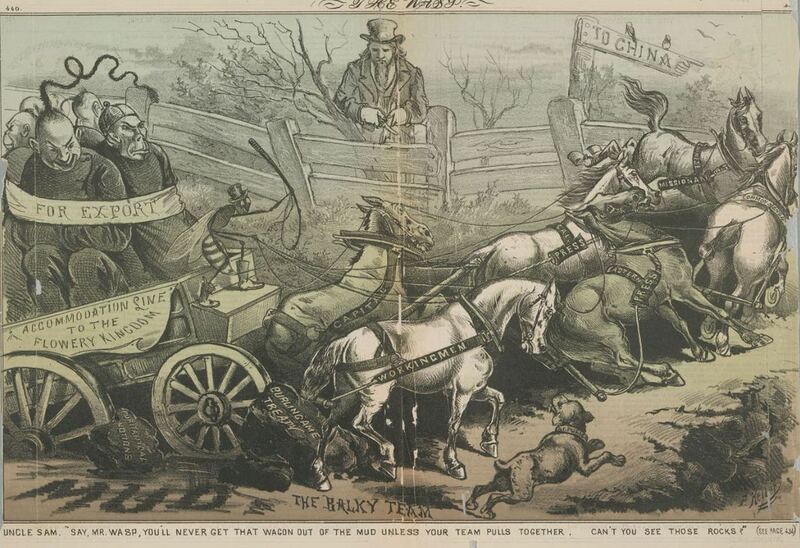 In The Balky Team on February 16, 1879, the treaty is represented as a small boulder, an obstacle to be overcome with the concerted efforts of the united horsepower trio named Common Sense, California Press, and the Workingmen’s Party. But there is trouble in the mix—some powers of influence–the horses representing the Chinese Missionaries, a “balky” Eastern Press and Capital, resist the plodding ahead to export sinister looking Chinese, bundled as cargo, back to China. Uncle Sam warns the wagon master, a wasp (the magazine’s mascot), to get his team in order. Only a unified purpose can achieve progress beyond “puritanical notions” of East Coast sentiments. 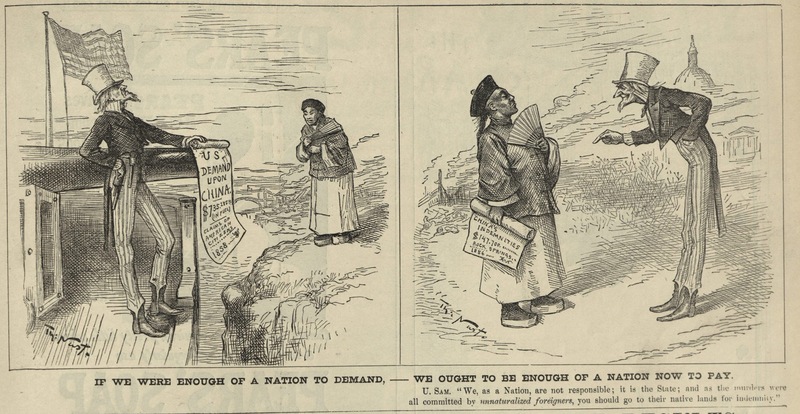 The Wasp editor reveled in the reviews from California papers that called this an “excellent cartoon” that depicted The Wasp’s efforts to haul the entire Chinese population out of the country. “It is a source of no small gratification” the editors wrote. “The Wasp is creating a sensation in newspaper circles” (The Wasp, Feb. 16, 1878). The Chinese Question had been answered six months earlier by passage of the Chinese Exclusion Act. A framed reminder that “The “Cheap” Chinese Must Go” so that the “Bear” Politicians May Live” is only one reminder on the wall that anti-Chinese racism prevailed as law of the land. The bear is the symbol for California. The issue concerning Chinese labor was only one that plagued Uncle Sam. 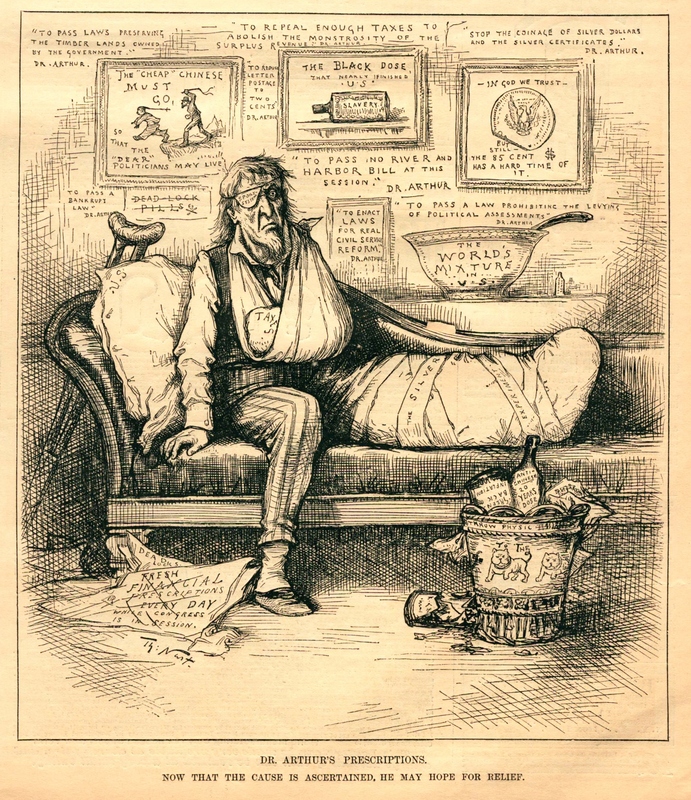 A very battered and bandaged Uncle Sam attempts to recuperate upon a chaise lounge. His grim expression reflects the ills and issues he has been forced to endure and symbolically represent. Laws, taxes, bills, enactments, proclamations, declarations all serving special interests. Written on the wall are excerpts by “Dr. Arthur” or President Chester A. Arthur. Arthur became president on September 19, 1881 after James Garfield’s death by assassin and served until March 4, 1885. “The Arthur Administration enacted the first general Federal immigration law. Arthur approved a measure in 1882 excluding paupers, criminals, and lunatics. Congress suspended Chinese immigration for ten years, later making the restriction permanent” (White House.gov). 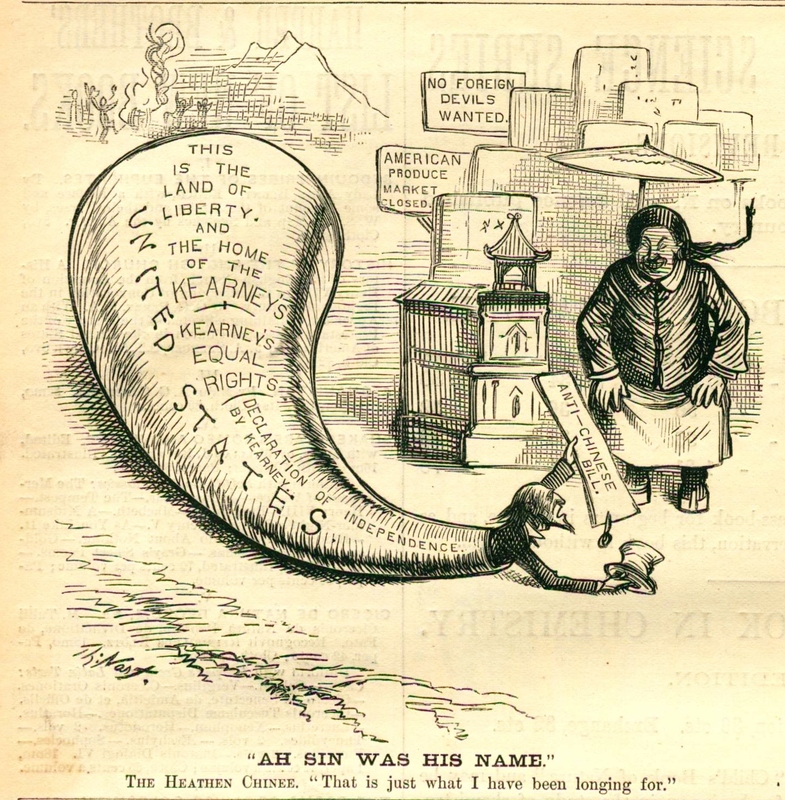 Thomas Nast once again borrowed from Bret Harte’s popular 1870 poem “Plain Language from Truthful James ” and the “heathen chinee” character Ah Sin as the focus of this cartoon against Denis Kearney, the leader of the anti-Chinese movement making waves in California. A gaunt Uncle Sam is seen crawling out of the tapered mouthpiece of a large bull horn with the “UNITED STATES” engraved along its long scrimshaw. The largest part of the opening faces West, where framed by majestic mountains a vaguely drawn figure dances around a campfire. Ah Sin appears startled by Uncle Sam’s weakened appearance. Ah Sins’s hands are on his knees, ready to rise. His queue vaults in the air by the surprise. Uncle Sam is unable to stop the fast-moving current of anti-Chinese legislation, and in fact, has become a reluctant courier — a mere delivery boy for Kearney’s orders. Nast’s message is clear. Denis Kearney has a big mouth. He needs a big horn. Kearney, an Irish immigrant, is the self-proclaimed soldier and leader of the Workingmen’s Party, an organization of white labor fixated on driving Chinese labor competition -— and all Chinese immigrants — out of California. By 1879, Kearney had been at his anti-Chinese campaign for a solid two years, effectively growing his agitated labor base. His voice still thick with an Irish brogue, Kearney’s charismatic Sand Lot speeches provoked white workers to violence toward the Chinese — and Kearney’s successful lobbying efforts led to the passage of numerous local anti-Chinese laws. National political candidates, most notably presidential aspirant James G. Blaine were eager to please a growing western labor constituency in the West. Kearney and his followers were sought out and courted for their votes. 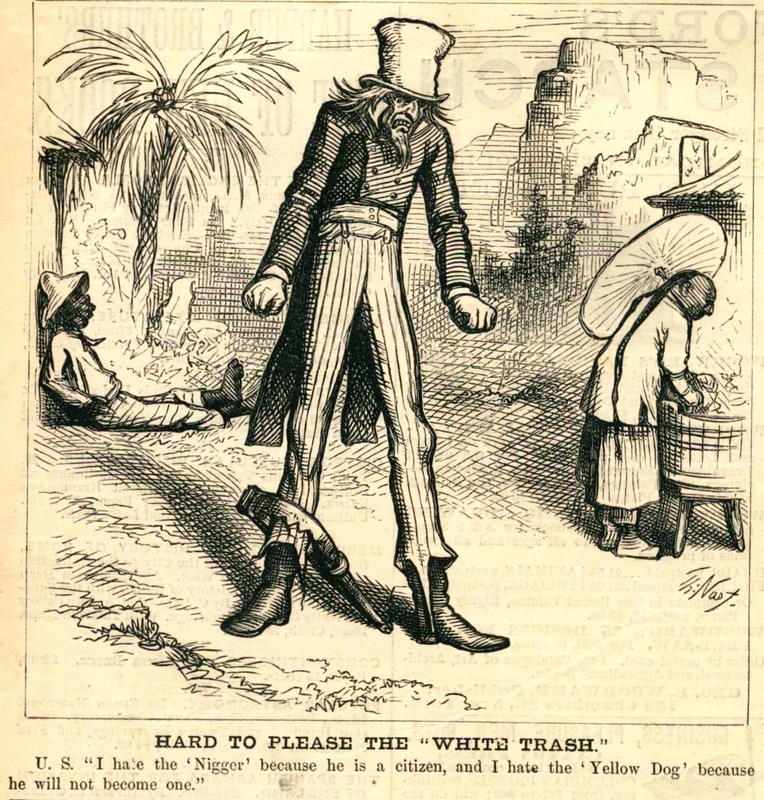 In this cartoon, Nast attributes Kearney’s loudmouth proclamations as self-serving attempts to remake and rebrand the U.S. Constitution as his own personal instrument to redefine the meaning of civil rights. Nast’s cartoon highlights the hypocrisy of one immigrant ordering another immigrant to leave the country.